As a child, Sarah got into big trouble for playing with matches and burning herself. Happily she can now explore her curiosity of fire and heat in her work with encaustic wax. Art in some form has always been important to Sarah St Laurent. A love of art began as a child, and was expanded while she was taking a degree in Horticulture at Texas A&M University where the Arts and Craft Center was as important to her education as the greenhouses. As an adult, she has especially enjoyed silver smithing, hand built clay sculpture, enameling and watercolor. It seems fire and heat has been a recurring theme in Sarah’s art quest. Since 2007 when she was introduced to encaustic it has been her primary focus. Sarah enjoys living in Asheville, NC with her husband. 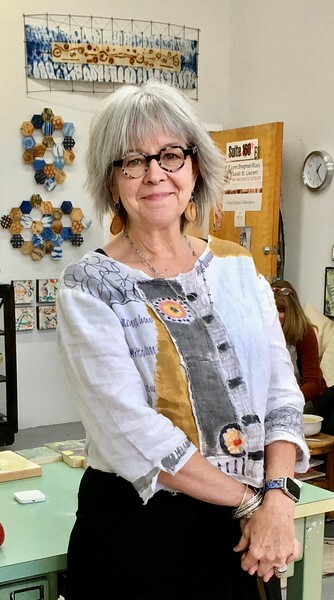 She has studied encaustic under Michelle Belto, Patricia Baldwin Seggebruch, Daniella Woolf, Ellen Koment, Paula Roland, David Clark, Shawna Moore and Laura Moriarity. She has shown her work in small art fairs, encaustic group shows and juried art shows. She has a studio in Asheville’s River Arts District in Wedge Studios. My medium is encaustic (beeswax & damar resin) and I work with the wax by melting, fusing and layering the wax. I love the artistic journey from initial idea to finished piece. I’m inspired by nature’s patterns and textures and the materials I use. The process of constructing a piece by combining elements and materials with the wax is exciting and fulfilling. I often add fabric, paper, pastels, metal and wood. By building layers of color, texture and pattern I can create rich textural images. Escaping to my studio allows me to savor the smell of the beeswax and the flow created between the torch and the wax. I have explored many types of art; hand built clay sculpture, metalsmithing, watercolor and enameling to name a few, each medium has influenced my perspective as an artist. I love combining forms of art together to create collaged, 2 and 3-D works. My current series combines fabric I have dyed and printed, encaustic and rusted metal. I also enjoy creating more representational encaustic landscapes to preserve or share a memory or a special place. There are so many ways to be creative with wax and few limitations. Fire and heat have been a recurring theme in my art quest and since 2007 encaustic painting has been my primary focus. I live in Asheville, NC. My work has been exhibited in national and juried shows and local exhibitions. I have a studio in Wedge Studios in the River Arts District in Asheville.